I went to my demonstrator's website today and was graphically reminded that only TWO WEEKS remain for the retiring stamp sets and accessories. If you haven't checked out what will not be carried forward into the new 2012-2103 Idea Book and Catalogue, you'd best get on that. 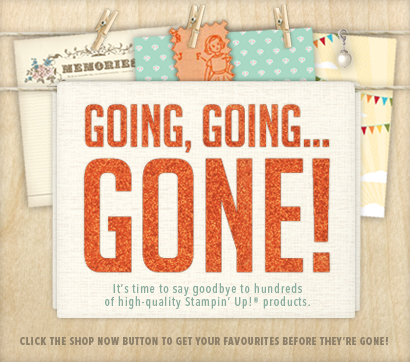 I don't want you to be disappointed, and soo many stamp sets and accessories are being discontinued, that I wouldn't be far wrong if I said that at least one of your favourites will be gone for good after May 31st. The stamp sets will be available until the end of the day on May 31st, but the accessories are only available while remaining supplies last and many have sold out already. Click on My Stampin' Up Store link to shop online any time of day or night, and have it delivered right to your door. You can also call me with your order. The good news is that I have seen the 2012-13 catalogue, and you're going to love all the new stamps and accessories that will be coming your way. If you would like a copy of the new catalogue, just reply to this post or on my Facebook page, and I will see that you get one. Here once again are the lists of retiring stamps and accessories, as well as the Definitely Decorative line. Hmmm... I'd better get a couple of those decor blocks sets myself, before they're all gone! See you! Gotta shop!